Who Is The Voice Of Starfleet Computers In The Star Trek Universe? Spaceship Earth, The Iconic Disney World Epcot Attraction, Was Designed By Which Sci-Fi Writer? If it seems like every Star Fleet ship and station in the Star Trek universe has a computer with the same voice, you’re not imagining things. 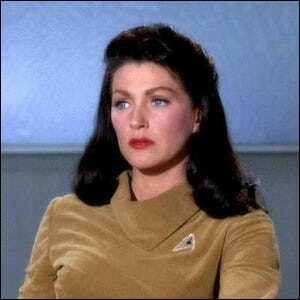 Majel Barrett, the wife of Gene Roddenberry, was the voice of the computer in the original episodes of Star Trek as well as Star Trek: The Next Generation, Star Trek: Deep Space Nine, Star Trek: Voyager, and Star Trek: The Animated Series, all the Star Trek movies, and most of the video games and other franchise productions. Barrett, then Gene Roddenberry’s girlfriend, appeared in the first episode of Star Trek as the First Officer, went on to voice the computer, and appeared in a recurring role Nurse Christine Chapel and in later incarnations of the show as Lwaxana Troi. Barrett was a lifelong fan and devotee of the show and never missed the chance to attend Star Trek conventions to spend time with fans. Barrett continued to work on material for the franchise over her entire life and completed the voice-acting work for 2009’s Star Trek relaunch just days before her death at the age of 76.